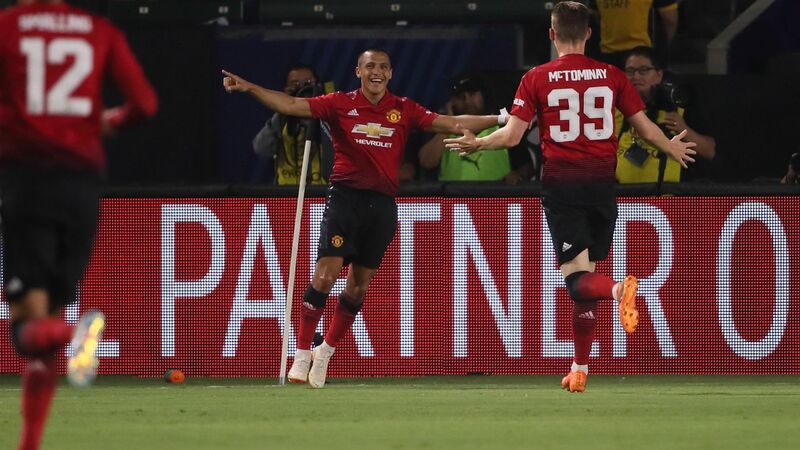 Manchester United have technically picked up their first win of preseason, beating AC Milan on penalties after regulation ended with the scores tied at 1-1. Both goals came early, as Alexis Sanchez gave United the lead, before Suso grabbed the equalizer for the Italian side. The resulting shootout was a marathon affair, going 13 rounds before a miss from Kessié gave United a 9-8 win. The biggest talking point from the starting XI named by Mourinho was the fact that defender Matteo Darmian was given the captains armband. The right back is far from a fan favorite, with most ready to see him go. There are several Serie A sides linked with the Italian, with Inter Milan seemingly the front runners. With the potential transfer imminent, there was a high chance that this would be Darmian’s last match for Manchester United. With that in mind, Mourinho decided to give Darmian the captaincy as a parting gift of sorts. The right back had a solid outing, not making any mistakes defensively, but not doing much going forward, and even converted his penalty in the shoot. It was a performance that summed up his United career well, as it was decent, yet unspectacular. At least we’ll all have the memory of the time he dropped a 10/10 performance in the 2017 Europa League final. With Romelu Lukaku and Marcus Rashford still on vacation, and Anthony Martial unavailable due to the birth of his child, Alexis Sanchez was the man to fill in the striker role for the match against Milan. The Chilean has shown promise at the position in the past, doing damage centrally for Arsenal and his national team. It was no different this time around, as Alexis grabbed a goal, and was a constant danger throughout the game. He opened the scoring early on, when Juan Mata played him in behind. Sanchez converted the chance expertly, opening up his hips, and slotting a finish into the bottom corner. He had another chance late on, when Darmian dinked in a quality ball towards the top of the penalty area. Alexis went for the spectacular, but hit his volley just wide of the target. The Chilean linked up play well, and was able to get his teammates involved up the field. With the Premier League opener getting closer and closer, there’s a bigger and better chance United fans see Alexis Sanchez line up at striker to start the season. Many have already realized that Manchester United need to sign an elite defender in the offseason, and this match only further cemented that claim. Chris Smalling got the start alongside Eric Bailly, which will probably be the partnership that United start the season with if no signings are made. That problematic duo was exposed early on, as a simple long ball wasn’t dealt with due to a miscommunication between the defenders. Milan winger Suso got in behind, and volleyed past United keeper Lee Grant to tie the game. The defense did not have much to do for the rest of the outing, but still looked shaky whenever called upon. It has become clear that Chris Smalling is not good enough at the highest level, and should probably be sold in this window. Eric Bailly has been proven to be much better, but the Ivorian suffers when played alongside a less competent partner, as he has to do more work than necessary. Whether it be Toby Alderweireld or Harry Maguire, Man Utd must bring in another centerback before the summer window closes. With a bunch of the usual starters yet to return from their post World Cup vacation, the match against AC Milan gave several players a chance to try and impress Mourinho. One such player who took the opportunity was Juan Mata, who is making a serious claim to be a starter against Leicester City. The diminutive Spaniard was deployed in his favored central attacking midfielder role, in behind Alexis Sanchez, and was United’s main man going forward. Any attack ran through Mata, who only grew in influence as the game went on. His assist was a thing of beauty, as he dinked a through ball over and in behind the Milan backline, where Sanchez finished the chance off with ease. There have been a constant stream of rumors linking Juan Mata to a move away from the club, but performances like last night’s only prove that United still need the Spaniard.